C vraiment eux? C pas truqué?? Parce que si c le cas, Kim est plus que ravissante!!!! Elle a trop changé: elle a minci et ses cheveux noirs lui vont super bien. Quant à Em il est vraiment très classe!! Vraiment c une très belle tof de mariage!!! I guess online reports of the wedding are wrong again! They said Kim had her blonde hair worn down when she arrived at the Hall. Here she has brown hair, which is a first time I seen a pic with her having brown hair. That is a good pic! Thanks! Wow, is that really Kim? But remember their first wedding photo, she was taller than Em then too! :)Maybe she has had a niptuck operation? That is not Kim, she is doesn’t have a face like that, blonde or not…. and Marshall looks miserable, not a happy just married man. I also was thinking that, that Marshall doesn’t really look happy!! I figured he would be grinning ear to ear after remarrying the love of his life! I hope he is truly happy! Although, I think maybe losing so much weight from her drug addiction and the fact that her make-up was probably professionally done instead of the normal “Kim” make-up (awful lip-liner and stuff) might have made a difference in her appearance! Still am not for sure that that is Kim! Hey Isa. Chillin’ here in Vegas. I can’t believe Em went and shackled himself again with the ole ball and chain. He doesn’t look happy at all. I just hope it works. Man, have you ever seen Marshall happy? That’s the way he is, he seems sad al the time! But yep, it’s his marriage man, it’d be good if he smiled or something! I think that’s Kim, coz when compared the old pics with it, I noticed that their eye shapes are same. There are a little similarities. She must have changed with rehab, I think. Hey, id like to say thankyou to the person who went out of there way to find the pic. But i don’t think that is kim, i couln’t care less about the pictures i just like the music. Somany pepole have this photo saying that its kim when i dont think it is nobody can change that dramaticly. I think we will end up seeing the proper photos over the weekend. But everybody stay calm, and just wait. The more I look at this pic, the less I do think this is Kim…I have seen tons of Kim pics and this woman doesn’t look like Marshall’s wife. Là on voit mieux que c pas elle du tt. Kim a un visage plus rond. This picture is the one that is in People Magazine I have heard. I guess rehab did do Kim good!! Still will wait to hear what Isabelle has to say! And Whitney is Hailie’s half sister! I hope she is well since she had to go to the Dr.! you know! i really agree with you on this one, i think that’s not kim, she looks so different, but you never know.Please let us know if it’s her or not. Cedes, how come that I don’t believe you? Your IP shows that you are posting from Atlanta, you pathological liar! Is this pic from People magazine really? Are there some other pics of them in the magazine? I have heard Hailie was the flower girl at the wedding. Is it true, Isabelle? If it’s is there a pic taken of her as a flower girl? Modern technology doesn’t lie…IP’s don’t lie…and I don’t believe any word of what you are saying. Plus this is definitely NOT Kim on that pic unless she has done some serious plastic surgery…this is an artificial “Hollywood” look, Kim always looked very natural…I even doubt this is the real Marshall on that pic…must be a lookalike…this pic has probably been made to fool the papparazzi…the more i look at it the more it appears to be a fake. I’m not the only one in this world to think it…the authenticity of this pic is debatted on many websites! If it’s fake, how come it’s from People magazine? Will I ever see a pic of them that is not fake? I do think that Eminem want his wedding pics to be kept private…I can’t picture him selling a wedding pic to a goddamn tabloid, that’s not him! Yep I agree with you Isa, Em’s not kinda person that’d sell his wedding photos to a magazine. He’d never do something like that. Em’s eyes are sleepy, they don’t belong him. I know I might be wrong, this wedding pic might be wrong, I’m not sure but they’re quite similar. People who join my group, I wait for your comments! Please leave a message when you join. By the way, I’ll keep looking similar pics and will put them to my group soon. ok that is Kim and Em they just got done up for there weddings who wouldn’t they want to look special and she did dye her hair i seen pictures and its alllll make up man its there special night seriuosly its them!! I added some new pics to my group. Check it out! Frankly this couple looks too much plastic to be Em and Kim…it can’t be them unless they have undergone lots of plastic surgery. That doesn’t look perfect, that looks plastic and unnatural. The chick resembles much more Danii Minogue than Kim Mathers. I might be wrong but i doubt it is her. And Chrissy, Dawn did not attend the wedding so it can’t be her. The guy looks like an Eminem lookalike. Eminem doesn’t have such a thin nose and those are not his eyes. I do believe that this pic is a fake…maybe i am wrong but time will tell…we will know in the end. Yep, but I can be make-up too. Let’s wait, the truth will come out soon. i still think that’s not kim. wow this has a lot of comments!!! good one Isa!! AND 4 GOD SAKE KIMS HARE IS BLACK ON DA PIC!!! HAS SHE EVER HAD BLACK HARE??? ON THE WEDDING??????????????????????????????? Eminem’s facal structure looks like hes but the eyes look nothing like him normally or in da house…. Yep you’re right Isa, I’ve seen some doubles of Em, they’re almost same! The man in the pic might not be Em, I’m not taking sides here. His eyes look sleepy there. Didn’t the label make a comment about that? They gotta explain the truth to end this confusement about the pic. i read somewhere that em wore a white tux while his groomsmen and proof wore black. What?! Everything about that pic is wrong then! It’s told Kim has had blonde hair and now it’s told Em has worn white tuxedo! Will we ever reach the truth!? Beekat, this pic is not real…i believe it…there must be an explanation behind all those contradictory elements…maybe the whole wedding ceremony was a hoax…and the Mathers got married elsewhere…that’s my impression! i truly believe that you are right by saying this isnt em and kim, i believe it could again be eminems doubleand this pic is only a publicity stunt to stop the papers and magazines following them. Did you also know that Star Magazine had an invitation to ems wedding, i still think the pic is wrong. 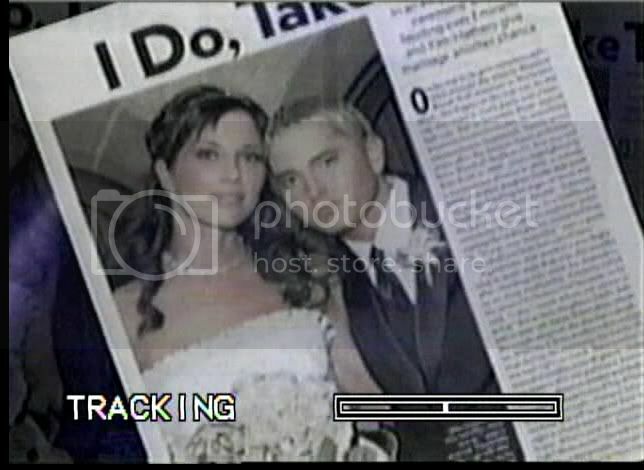 I know that the Star Mag had an invitation, it is even through this tabloid that i discovered the date of Em’s wedding…but I am convinced that Em would not sell his marriage pic to a tabloid, whether the Star or People mag…and Debbie Mathers’ statement( she said that Em and Kim’s Saturday wedding in Detroit was a hoax and that they would marry on Monday the 16th in Hawaï) has a meaning. Also, I recently came accross an article stating that many celebrities faked their marriage as a good way to get rid of the press and went peacefully married elsewhere…knowing how much pressure Eminem experiences from media and tabloid, this is likely to have happened. I think this fake pic and the other contradictions in those press article reveal us a lot. they got married and we’re happy for them right? Isabelle like you said “time will tell”. I think this “Is it true or not” situation began to bore. You’re right Karen, the important is that they got married and they’re happy. hi everybody. just wanted to say i’m so glad i finally found somewhere to get new info about em. most websites i’ve visited where people were chatting the people are CRAZY! anyway, glad to be part of this! Hey, I find it hard to find the stuff I used to check on all the time when visiting this site now!! I want to get to the Kim Mathers page, and not sure how I can do it and other pages I visited! UGH!!! Isabelle, help me navigate through your updated site! I know how to reach Kim Mathers page, you can get there as soon as you click on Archives. Yes this new design is a lil bit complicated, but I like this one too. On BeeKats sight you can see a picture under the album titled KIM and the caption says she looks great or something, well look at her teeth in that picture and only what you can see close up in the wedding photo. She has teeth like Hallies they have a lot of gums, this “wedding picture” shows a straight, perfect smile! Oh let me guess veneers right? Just wanna say, have a nice weekend to all of you!! I’m sorry to ask, but i’m a little bit confuse, those pictures tommy has, aren’t they the same from the ones we’ve been talking about?. Are those the ones eminem supposedly sold to the Hello Magazine? cause if those are the ones then the first one is real. Yeah Karen im confused too, please tell me this isnt kim if it is i think ill cry i really cant imagine kim looking like this. Isabelle please help us!!!!!!!! what are you talking about, why would you cry if this is kim? ja,ja!! you’re nuts! I have a question and i really hope you don’t misinterpret it or get upset about it. I was on the mojo in the morning website once and i read about the interview with kim’s relative, eminem’s former nanny and then kim called the show to give her a piece of her mind and marshall as well, there was a place or something you would click to listen to it and i see that you also had it somewhere in the Gavin’s blog, but when i clicked on it i couldn’t diplay the page, for some reason it won’t give it to me. My question is how can i listen to it? Isabelle i tried going in, but i don’t see it anymore.they only have show archives and it’s not there anymore, now even if it was,when i go click the click here it won’t display the page. it would give me an error.why do you think it’s doing that? I’m sorry Isabelle if i even asked for this information, i really don’t do it for any bad reasons, i only wanted to listen to it, you know! thanks anyway. OOOHH!!! THANK YOU SO MUUUUUUUUCH!! Hi, I am a massive eminem fan like everyone else here, I’ve bought an English magazine that has the same photo just less of it has been cut off, check the tattoo on her arm its the same as the one kim has. I have seen that tattoo on other scans…to me, this tattoo doesn’t prove anything…knowing that Kim has some other tatoos…Where have her other tattoos gone, then? Plus anybody else can have this kind of tattoo…doesn’t prove anything to me. That picture looks so fake, just look at eminems head where he leans too kims lift eye,it looks so fake like somebody did cut and glue the head on the picture. And look at “kims” left (our right) shoulder you can see it has been brushed. Isabelle, first i agree with you on the fact that the picture really looks fake, but what i said about kim’s image it’s only my opinion, and you know we are all intitle to think different than others, now yes!on other pictures she looks like a regular person, a regular person with lots of problems,i’m sure kim herself aknowledge the way she looks in those pictures, but maybe she just don’t care, and she has all the right to not care about them. It’s not that i want to make her look bad nor talk bad about her, but let’s be realistic, some of her pictures just makes her look in a bad condition.AGAIN i have nothing against her, is just that there are people out there who just cannot stand the idea that kim could be this beautiful and i was trying to tell them they should just feel happy, cause she’s finally getting recover from her drugs addiction;Also doesn’t matter how she looks, eminem is always gonna lover her anyways! Do you have any way to post that picture in the site, so we can all see it? im glad u posted that comment, I would luv to see the pic too? Isabelle what do u think about the newest comments? hey,i think that that is really kim,she just went thro a lot to look like that. she seems so into appearances and everything so yeah…she probably knew that the pic would made the press and for once she wanted to look more mature and stable. i think she looks beautiful, although i have to say eminem doesnt look too happy. I don’t think this is Kim. I don’t think this pic would make her look more mature or stable. This pic looks artificial. Kim is beautiful and natural the way she is. I really hope she did not change to that extent. i agree with isabelle 100%. I think all this is just going a bit too far, and i’m the first to admit that i have done so. That isn’t Kim. I know the truth but what can we do to prove it? There is no way to proove anything…all i can say is that this woman looks too artificial to be Kim and that this man can’t be Marshall. Look: if Marshall gained some weight before his marriage (and i saw him on TV before) and if he still looks like he has gained some weight after his marriage…this can’t be him…on this pic, he looks like a teenager. To me, this photo is a montage and probably a trick for Eminem not to be bothered in his intimacy…i think he didn’t want ppl to have pics of his marriage, he wanted the ceremony to be kept private…which is understandable. I respect his privacy and i wish Eminem all the best for the rest of his life. hm…Thought it was said that he wore a white tux? Well, a lot of things have been said about this wedding and many details are contradictory…still can’t prove it, but to me this pic is and will remain a fake. I have looked at many more pics. I even found some of the wedding from above like in a helicopter and even though it is at a distance you can make out the dress and the hair ornament as well as the hairdo that is in the people mag photo. I do believe at the angle that it was taken it is her. A pic of eminem also in the red cap (keep in mind they do have umbrellas over them but she turned back as if to talk to someone so you could see her and em IS in the red ball cap as well) I believe it is Kim looking her very best in the photograph. Papparazzi do not need eminem to sell his photos. DUH! She arrived in a white stretch limo and he in a black stretch. Too bad it didn’t last. I think PEOPLE Magazine is too reputable to post a fake and can make you look great in a picture. I have a photo of my own that is like the best picture I have ever taken and some people don’t think it is me. If that is Kim in that picture she should hold onto the names of the sylist, makeup artists,lighting staff. A miracle was worked that day! I don’t really think so…anyway, Kim is much more beautiful with her natural looks…whatever some ppl might say…miracle? this pic looks artificial, overdone…i don’t like it at all. here is a picture i was able to find of the woman who wrote that book that Ali Cat said was her cousin.